It’s picnic season which means lots of sweaty backs, hot grills, ice cold beer, hamburgers, and hot dogs. It also means that grocery stores are creating condiment stands where you can grab the staples for your backyard BBQ all in one place. Classic yellow mustard, sugary ketchup, pickle relish, and some soft white buns coming right up! 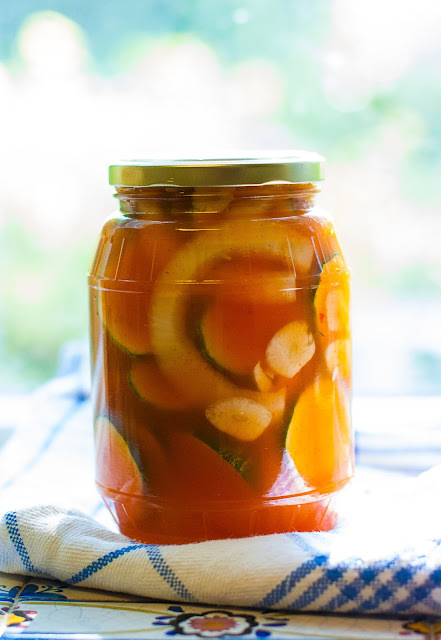 This gives me a great excuse to throw a few punches at traditional picnic condiments by making my own, like these spicy and sweet Sriracha Refrigerator Pickles. They are so easy to make. With only a few ingredients you can add a crunchy new twist on top of your juicy burgers, or dice them to make a spicy relish to slather on hot dogs. Or, do as I do, eat them right out of the jar. Making refrigerator-style pickles is so easy you’ll wonder why you ever bought a jar of soggy pickles at the store. The key to making a good pickle at home is to buy fresh cucumbers from a farmer’s market or organic grocery store. If you buy a wax-covered cucumber and try to make pickles with it, well, it just won’t work. Remember: dull skins, not shiny. A dull skin means your cukes are happily unwaxed specimens, and perfectly ready to pickle! In a large microwave safe bowl with a spout, stir together apple cider vinegar, sugar, sriracha, and salt. Place in microwave for about 3 minutes; stirring once to ensure the salt and sugar are dissolved. It’s best if the brine is still warm for the next step (speeds up the pickling process). In the cleaned and dry 1-quart jar, pack cucumbers, onion, and garlic slices very tightly. Pour the brine over the cucumbers until completely covered. Seal and refrigerate. Pickles will be tasty within a few hours, but best after one week. Will last up to 3 months in the fridge. My husband would really LOVE these! Great idea. Good tip ref choosing cucumbers. The pickle looks just the thing for my next picnic. I'll have to google 'Sriracha' but always delighted to be introduced to a new ingredient. Very cool - I love Sriracha on EVERYTHING and this is such a fun idea!!! They are delicious, but mine are wrinkled....not very good looking! I've tried this recipe twice but my pickles shrunk up and wrinkled.....any tips? Hi Leah! I'm sorry they are shrinking on you. That is often the result of the type of pickle used. Not every pickle is built for pickling. Are you making sure they are unwaxed pickles? I also recently made this recipe with cornichons and it was awesome. Let me know if you need anything else.